click image for close-up When Elizabeth Freeman was nearly 70 years old, Susan Ridley Sedgewick painted a miniature portrait of her in watercolor on ivory. 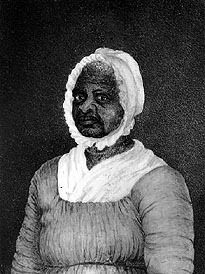 Sedgewick was the young wife of Theodore Sedgewick, Jr., whose father had represented Freeman in her claim for freedom from slavery under the Bill of Rights and the Massachusetts Constitution of 1780. Susan Sedgewick, the granddaughter of a New Jersey governor, was a writer of juvenile fiction. She was 23 at the time the portrait was painted.